-Type / Architecture / Interior Design / Villa / Penthouses / Building Recovery and Renewal. This classical villa in the charming Hellerup district of Copenhagen has become the home of a Danish family. The design concept takes its beginning in the structure and textures of the original features of house and in the needs of its family, it pays tribute to the typical and representative Danish building tradition. 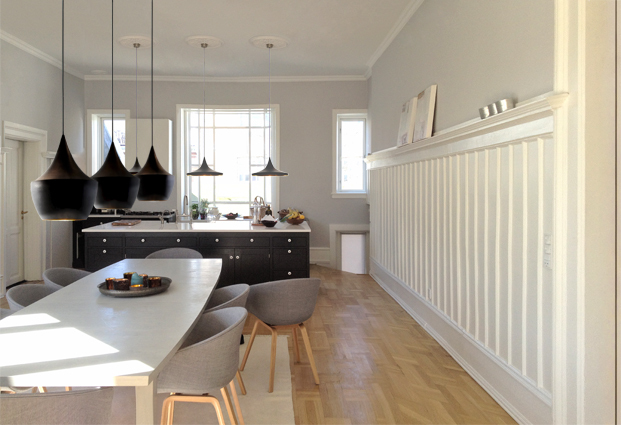 A strong spatial interventions were made in the layout of the house, a kitchen was enlarged and extended into the dining room and a new master bathroom was added in the main floor. The north facing living room serves now as a library and music room and the adjoining south facing winter-garden is today the main sitting room with a direct acces to the main garden. The original wooden floors and the lavish white unique wooden features were restored and all rooms were framed in cosy grey tones. By adding new features and details in the special designed furnitures we believe we have contributed to the lifestyle of the family.